Store IT equipment discreetly in the office, with a stylish wood-finished server cabinet. The RKWOODCAB12 12U Office Server Cabinet lets you store your server, network or AV equipment discreetly in the office, with a stylish wood finish. This TAA compliant product adheres to the requirements of the US Federal Trade Agreements Act (TAA), allowing government GSA Schedule purchases. Designed to blend in with your office or boardroom furniture, this 12U server cabinet features wood laminate exterior panels with a shaded glass front window that keeps your equipment visible for monitoring, as well as front and rear key-locks to prevent unauthorized access. To help keep your valuable equipment running cooler, we've included a ventilation panel to maximize airflow. 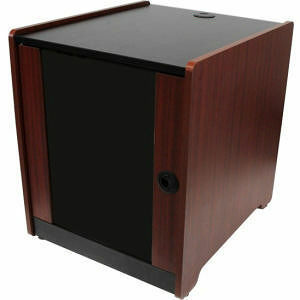 The cabinet also features durable casters, so that positioning your server equipment as needed isn't a hassle. The 4-post enclosed rack supports a weight capacity of up to 300lbs (136kg) and offers rails with adjustable mounting depth from 16.7in (423mm) to 20.6in (523mm) to accommodate various sizes of equipment. Making it easy to route your cables where you need them, the 12U cabinet offers cable grommets on the rear and top panels, and a cable entry panel at the base.